Did you realize that knowing just 4 wild edible plants could one day save your life? If there were any four categories of plants that I would recommend all people to know how to use and identify it would be these: Grass, Oak, Pine, and Cattail. For the knowledgeable survivor, knowing just these four plants can make the difference between life and death if stranded in the wilds – for each one is an excellent food source which can sustain you until help arrives. Surprising to many is the fact that you can eat grass. 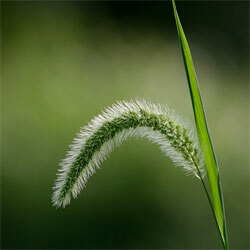 Despite there being hundreds of varieties of bladed grass found in the Americas, almost all (99% of them) can be eaten. This ranges from wheat, oats, and bamboo to the wild meadow varieties. The best part of the grass plant to eat are the seed heads, which can be gathered to make millet for breads or filler for soups & stews. Of the 99% that can be eaten raw, about 1% have toxic seeds and require that you roast or cook the seeds first. As a word of caution, stay away from blackish or purple colored grass seeds. This is a good indication of toxic fungus. Just make sure they are green or brown. Also use common sense when gathering. Don’t gather where there has been recent sprayings of weed killer. Oak – specifically the acorn – is a great source of food in the fall and early winter time. Like most nuts, acorns contain a good amount of protein and fat which is beneficial in keeping you alive. While White Oak species of acorns can be eaten right after shelling, the remaining oak varieties require processing of the acorns first in order to remove the bitter taste. I found that many ‘survival guides’ explain you only need to shell the acorns then boil them in a couple changes of water to remove the bitter taste. However, in my experience, it takes far more than a couple of boilings and on top of that it is a waste of fuel. The best way to do this is to crush the acorns into a course flour then immerse this flour into water and boil it. Depending on how much water used, it can take only one boiling (at most two) to remove the bitter taste. After straining the flour into a t-shirt, the resulting acorn ‘dough’ can be eaten as is, set out to dry to be used as flour at a later time, or added to other flours for a great tasting bread – in fact, every Fall I make a killer ‘acorn bread’ that is a family and friend favorite. “You can eat pine? !” Yes, pine trees are an awesome food source that I’ve eaten throughout the year. “OK…so how do you eat it” Good question, let me explain. First of all, if you’ve ever eaten pesto, chances are you’ve eaten pine. ‘Pignoli’ or pine nuts are a common ingredient in pesto and are often served on ice-cream . Every species of pine produces seed (or nuts in this case) and all can be eaten. In the late fall and early winter, the cones can be gathered, opened, and the seeds extracted. The only issue is that most pine don’t produce large seeds like for example the pinion pine does. In the spring, the male pollen anthers can be eaten and are high in protein. The inner bark of the pine can also be eaten and surprisingly makes quite a tasty meal if prepared right. 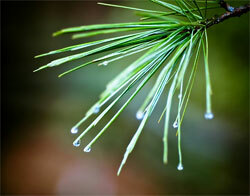 And with some species – like the white pine – it can be surprisingly sweet. In addition, pine needles can be gathered year round to make a great tea which contains a ton of Vitamin C (not in the least bit ‘piney’ tasting as you would expect). This is my favorite wild edible. Not only is it referred to as the wilderness ‘supermarket’ (because of its many edible parts), but it has some great medicinal and utilitarian purposes as well. Cattail provides something to eat year round. And the amount that you can gather is quite substantial. In fact, a study was conducted at the Cattail Research Center of Syracuse University’s Department of Plant Sciences by Leland Marsh. He reported that he could harvest 140 tons of rhizomes per acre near Wolcott, NY. That equates to more than 10 times the average yield per acre of potatoes! In the early spring the young shoots and stalks can be eaten raw or cooked. The flower heads in late spring can be husked like corn and boiled — in fact it has an almost corn-like taste. Very yummy. 🙂 In summer, the brown-orangish pollen heads can be eaten raw or dried into flour. Fall is the best time to gather the horn-shaped corms (the sproutings of next years’ plants) which are eaten raw or roasted. And in winter, the root stalk is full of starch which can be broken up into water, dissolved, strained and dried into flour as good as wheat flour. Even if you can only identify the previous four categories of plants, knowing how to use them can give you enough nutrients to stay alive. Supplement that with some additional plant knowledge and some hunting/trapping skills and you can forget surviving, you’ll be well on your way to thriving out in the wilds! For the next week, I’ll be going into detail on how you can process and use each of the above groups of plants for life-sustaining food. Stay tuned!! Very nice site. First time here. I’ll be posting your site on my blog- hope it helps with traffic. Thanks for the tip! Your absolutely right about the tannic acid used for animal hides, although I’ve never tried that way (I’ve only done the traditional brain-tan method). It also makes a great astringent to be used on cuts and gargled for a sore throat. Thanks for the link (I’ve added you to my links section as well). I didn’t know any of this! Thanks, Erich, for some great information. Do you also know a bit about plants for medicinal purposes? That’s something I’d like to learn more about. Yes I’ve been taught quite a few medicinal plants as well (have used a number of them for my own and family ailments). I’ll be doing some future posts on this as well. far from it. But thanks for the kind words! Stumble upon brought me to your site. Great info! I think a major plant you missed though would be the much maligned dandelion. Super high in nutritional content, with some medicinal properties and found almost everywhere in abundance. Once again, excellent! I tried a Dandelion salad two weeks ago, and found it to be horrendous! Any suggestions for a palatable dish from them? I used to think that it was an accquired taste but I was wrong. Take about two lbs of dandelions (fresher the better) cut off the bottoms and larger stems. Rince the leaves in cold water and use a salad spinner to remove sand and access water. Place dandelions in a salad bowl and pour over a Raspberry vinaigrette mixed with honey. Stir and serve cold. I have also used bacon bits mixed with the vinaigrette heating the honey and vinaigrette and pouring over the greens for a warm dish. The combination of the bitter and sweet was pretty good for a weed diner. By the way 40 years ago I tried the dandelion wine and have been looking for that receipe. First of all, thanks for visiting! Yes, I agree. The dandelion is a wonderful little plant – great source of food and medicine. I will be covering it late this spring. 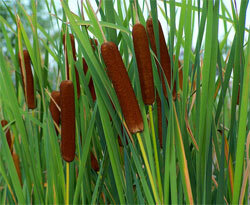 I like your article but have to ask one thing about cattails, HOW do you eat the white inner plant? I’ve tried it on several occasions and to me, it simply tastes like crunchy swamp water. Disgusting! Is there a method of cooking that will get rid of this flavor? Oh, and that included the rhyzomes too. The seed heads are nice if you add the pollen to pancake mix about 50/50. I’ve never tried the “horn” but will certainly give it a try this year. I’m not sure if you’ve read it already but my article on How to Eat Cattail details the process for eating cattail rhizomes and corms (I’ll be adding to it this coming spring and summer for the foods it provides at that time of year). Let us know how it works out for you, we’d love to hear from you again! As a kid someone told me that you shouldn’t eat acorns till after they laid on the ground for a certain amount of time. Something about them making you VERY sick, could that be the tantic acid? It may be, consuming tannic acid in large amounts probably isn’t too healthy. I can’t imagine that someone would ever eat that many acorns without removing the acids given the bitterness of them (caused by the tannic acid). However, if you process it the way I outline in How to Make Acorn Flour you will effectively remove all the bitter tannins. I would probably not have chosen the pine, acorn or grass as their availability is too dependant on seasonality or location. The gathering and processing of these 3 are also too labour intensive to be a realistic survival food. Things like dandelions, chicory, plantain and nettles are more readily available and have no processing time. Dandelion is available all year round. Burdock root is an excellent choice too,but more labour intensive. Probably one of the best is Daylillies since their flowering season is so long. Ramps, fiddle heads and asparagus are great early spring choices, dandelions, plantain and nettles are late spring foods until berries become available in the summer along with milkweed buds, lambs quarters and purslane. The fall is the time for roots and tubers, nuts and seeds, but, in a survival situation, they should be evaluated based on caloric return. Jerusalem artichoke is an easy and rich target in the fall but the consumer will be plagued with flatulence until a tolerance is built. 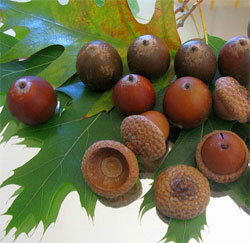 For those who raised the issue of tannic acid in acorns, there is a difference between oak species. White oak (rounded leaves) have less tannin than red oak (pointed leaves). The meat needs to be ground, rinsed for several days in running water then dried if it is to be stored. If the nutmeat processing is delay by even a day, the acorns should be baked to kill the worm. Even delaying the processing by one day could result in the loss of your whole find to the worms.. I am happy to see discussion on these wild foods. People who are looking at these foods as part of their survival or eco initiatives should be incorporating them into their diet now so they can learn how to best identify and prepare them. Thanks for the great input Sherri. You’ve got a great resource available with your site. Great info. i would add earth worms to the list for a little extra protein and nutrients….yum. That’s pretty cool Milo, I didn’t know that. Amazing! I was wondering if people can eat cat grass as well. I grow it for my cats of all year long. I’m going to be watching out for those cattail plants. Both cat oat grass and cat wheat grass have edible seeds. The cat wheat grass is what we often use to make wheat grass juice, so yes cat grass is fine for humans. just a warning, cattails are pretty good at absorbing pollution, so it’s probably no good to eat cattails in polluted environments. You are indeed correct. If you’re looking to try out cattail be sure to try to look into an area that is away from farm run-off or nearby major roads. If it was for survival purposes, that’s a whole different ball game. Unbelieveable!! Just found your link through SurvivalMom. Started reading about processing and eating acorns. Already knew about dandelions, although I haven’t actually tried them yet. What has me laughing, though, is how hard in years past I’ve tried to get rid of both the dandelions and HUGE acorn crop that cover my yard every year!!! Wish I’d known sooner!!!! Thanks so very much for the information – I really can’t wait to try the acorns. How fresh do they need to be to use? I still have acorns on the ground from last fall!! I have 2 huge, prolific oak trees in my yard. Thanks for visiting! As for acorns this late in the season, you may get lucky with some of them, however most by now will be eaten through by the acorn weavil and other bugs (they drill a hole in the acorn and lay an egg inside so that when it hatches the larva will eat the acorn while it develops). To test it out, just open a few and see if the nut is still white all the way through. If so, it’s good to use. I am really enjoying reading all the posts on this wonderful site! I’ve been Googling a question that I haven’t really found an answer to and hope you can answer it for me. I love wheatgrass juice but I am not really good at growing it. I have kits (seed, soil, kelp) and have been able to grow it but I would like to know if the seeds are edible without having to plant them? Can the seeds be eaten alone when they are just sprouting from soaking in water? Wheatgrass berries are edible (as is most grass seed). This is a great resource! I really want to learn more about how to survive in the wild, without having to eat animals, and this article is a great start! Thank you so much! Whenever I hear that we can eat pine trees, I always laugh and think of the Donner Party that couldn’t see the abundance all around them and felt the need to munch on each other. Knowledge is power AND survival! I, for one, am surprised to see grass being labeled “edible”. I have heard (read) stories about “grass salads” turning people green and bloating them out – to death. I know that cows have 2 stomachs to process grass, which I think is high in silica. I will accept that the seed may be edible, as you stated. but, still question the high silica content in the seed. Thanks for the great comments Michael. I’m also not sure about the amounts of silica in grass seed however keep in mind that the suggestions given in this article are for a temporary survival situation. None of these foods should be exclusively eaten on a long term basis. To your point, new studies seem to indicate that although many of our native grasses (specifically the seeds) have been used by the native Americans for centuries, they were only consumed a few weeks out of the year. The human gut is not adapted for consuming exclusively grains long term (especially if they are not ground up and cooked which aids in the digestion process). Although the seeds are quite safe and edible, they should only be eaten during a short-term duration. Lisa, large leaf Plantain is one of the useful medicinal plants that grows wild in a large part of the U.S. During the American Revolution it was called, “The Soldier’s Friend”. I’ve used it on wounds myself in the field. Aloe Vera is another one. There are hundreds. I highly recommend “The Green Pharmacy” by James A. Duke, PhD. could you direct me to “how you can process and use each of the above groups of plants for life-sustaining food.” Thanks! My family would fry a little fatback or bacon and make a vinagrette sauce to cook the dandelion greens in…then serve it over boiled potatoes. (We’re Irish extraction…) I still hated it, but the grapefruit eaters (I hate that, too…) in the family loved it. Dandelion greens should be in no way bitter if you grab them at the right season (early spring). Late in the year (summer/fall) they’re pretty bitter but still good if you’re into that taste (like your grapefruit eating family members). I wonder if it could also be attributed to worms? I know I’ve found many acorns with tiny little worms in them. Maybe if they’ve lain on the ground during a hard frost, the worms would be killed and then it would be safe to eat them. Please add a Pin It button to your site. Thank you. Awesome article! I’m so glad I found this site. I’d just like to mention that if you’re pregnant, don’t drink pine needle tea because it’s said to cause miscarriage/stillbirth. Also, I second the “pin it” button! Great post. I had hear of pine tea before, but acorn bread is a new one. I’ll have to try it. If you do try it let us know how it works out for you. What about purslane? I have heard that wild purslane is very good as a tea and high in vitamins.Do you have any recipes for using purslane? Purslane is a fantastic wild edible and is great in a casserole with egg and breadcrumbs. you can eat flowers too the buds and the stems they are very good!!! You should recommend growing mulberry trees on one’s grounds, a long road ways, well of the road, cottage country etc. The leaves of the Mulberry tree are edible. It has been assumed that too many may cause irritable bowel syndrome. It has been thought also to cause haullucinations. I’ve been adding about half a cup of crushed dried leaves to my soup every day for a month and nothing has happened except maybe to increase bowel production but I have been eating a LOT of vegetables. Another point that the Mulberry tree is a number one choise for planting is that the branches can be loped off to grow another tree by setting the branches immediately in water. Some experts say that this way of growing a tree should be done in root vitamin water, but I have done it in clear rain water but one can enhance this with placing leaves and mulched grass inside to increase nitrogen etc if one feels the need to do so. Right now, I have a twig that I am growing in fresh water tap and after only acouple of weeks I see a green bud forming which surprised even me. Getting it to root may be another problem. If one plants fruit trees, or any type of tree, remember that in the woods nature has fungis that kill off the bark. You should paint the trees with lime water, till the ground around the base to keep the fungis at bay, and add a lot of ash, a early form of lime. Also, to be added to the survival kit is the Wild Swiss Chard that some refer to as Docks. The leaves are edible. People that have kidney problems like Gall stones are told not to eat normal Swiss Chard & other vegetables. It could be that some people have over eaten a product and by products build up? I love Wild Swiss Chard leaves. It is best to leave some of the leaves to keep the plant in good shape. I have noted, over the years, that the plants seem to grow up in the same place from season to season. I must have harvested a thousand seeds this last fall to spread out along the roads. We will see how the deer like them. One must know what deer like to attrack them to a springwater, as opposed to chasing them around. Bears like potatoes, berries, & honey as do the deer. I also spread out milkweed seeds for the birds along with thistles. The inside stalk of thorns can also be eaten and pickled. God must have placed the thorns on so that there would be some food left over for the birds. I want to buy land and grow 13 lb Giant Grey Rabbits and hopefully, if I can get land, release wild turkeys, to increase the numbers as I heard that they are becoming extinct. Also, when one is hiking be sure to include packages of bean sprout seeds and an empty jar and lid that can be used as a cup. The bean sprouts sprout in two days if one was to get lost. Also, bears don’t like the smell of oven cleaner so I spray it on trees that they have scratched and on the bottom of my old shoes just in case they thought I might taste good. I don’t carry rifle and gun and travel alone so I include a water pistol that shoots 25 feet and fill it with red pepper and onion juices, and clorine. Usually, it drips out onto my slacks and I don’t need to buy army fatiques and the clorine does a good messing up. I’ve seen the bear and moose prints, and excrement, and they may have seen me. I just didn’t want to encourage them to follow me but they are inquisitive creatures so they usually keep a safe distance with the exception of the Grizzley. Shoot for the nose! Or, a good rock to the testicals! The heart is?…possibly above the navel? The best would be the ear and I do not feel sorry for the Grizzley…get over it! Remember you are tresspassing on THEIR grounds and it is NOT just the females that attack. The male will attack and defend their territory from squatters just like a German Shepherd…best to move back. My grandfather told me that the bear and moose, “do not see well”. I was taught to squat down slowly and crawl backwards as they sniff the air…excellent noses and to go in the direction of the wind that takes the smells away from them. Bears live a long time…some say 40 years near towns and others estimate up to 90. Maybe the bears remember me when we use to grow potatoes? At any rate, hike safely. And, do not use fruity shampoos that attrack mostquitos, flies and bears. “The Steam Pit”. Around the minute of about 5:37 (5.38) the tour guide is stating that, “One of his favourite ways of cooking is the steam pit”. Look in the background, just over the left girl’s hair and you will see, what was described to me, as a bear moving? Look to the right and someone said, over the hairlines, there were two more bears? FBI/RCMP did a quick investigation ?1987? as 1 man was found dead & he may have been interviewed when Adam Beach went missing but found & not lost. The man was partially eaten by a bear/s before or after death. It was decided by bear. If you keep going to the same spot to camp alone you should make a stockade or semi-stockade & be on the alert when walking thru the woods. Bear odour is VERY strong. Take a dog. Canadian Bushcraft that is the video of The Steam Pit and above the hairlines at about 5:37 bears in the background. I usually spray oven spray on my old shoes and around where I camp. I hike but I sleep in my car. Even the cooking of the leaves or smoke, urine & feces, can signal a bear. I also spray on the trees that they have recently scratched. If you are collecting mushrooms etc, in bear country, they know that you are invading their territory. Take a dog. You can pickle purslane just like cucumbers. They’re really good with dill pickle recipes. You can eat it raw in a salad. Nice and crunchy. I like it with ham and mayo and a few capers. You can boil it in a soup also. I don’t weed the purslane out of my garden, I just keep picking it and pickling and eating it! You can leave the smaller stems on the purslane and just chop it into smaller sized bits to pickle it, or you can get picky and pick the leaves off the stems. The larger stems are a little woody. I also enjoy lamb’s quarter as a pot herb (ie. in soups). It’s related to spinach. I tried pickling it, I’ll have to open the jar and try it. You can also pickle wild grape leaves. I also enjoy bishop’s weed in soup, but only before it flowers, because afterwards, it’s a laxative. I like to put broad leafed plantain seeds in my pancake batter. They taste a little like mushrooms. Finally, Jerusalem artichoke roots are pretty good, but it’s an aggressive plant, and the roots will make you fart just like the cat tail roots. You can also eat the leaves (boil them they’re tough). All the bushcraft stuff I’ve read or watched says you should cook and eat at least 50 (or more, I can’t remember) yards away from where you sleep, and you should do the same kind of thing (but not where you eat of course) with your latrine. If you have food you should hang it up in a bag in a tree, and not anywhere near where you sleep. If I had the choice to sleep in a car I would do that rather than sleep in a tent – it’s stronger and would stay warmer. Eat them early in the spring!!! Young plants. Otherwise mix them into your sandwiches and know they are good for you. If anyone is thinking of trying grass seeds, get them direct from the grass, not a bag of store bought grass seed. The seed bought in stores is coated with chemicals to fertilize and speed growth, and is extremely toxic. When collecting Pine nuts, get the Pine cones if they are closed up heat them in an oven or frying pan and they’ll open up so you can get the nuts. Even though acorns from the white oak group are less bitter, they still contain taanins-which are anti-nutrient, so you still have to leach out the tannins.This is an awesome video on acorns, by research botonist/ethnobotonist Arthur Haines. He has many extrememely informative videos and newsletters at his website: ‘Delta Institute of Natural History’. Keep rewilding! Another common plant that is good for food is purslane. It’s a good source of Omega 3s. It can be used fresh in salad or just eaten out-of-hand. It can be dried or canned, but I don’t think it would be as good or as nutritious as fresh. My mom puts it on sandwiches just like you would use sprouts. I think it has a slight lemony or sour tang. Tasty! I find the smaller leaves to be really yummy and eat them as I gather. I also really like the flowers as a snack while I’m working outside. I’m guessing washing them is a good idea but I’m not hung up on that. A bug once in awhile is just extra protein. You could start off by mixing the greens with some young lettuce. Another good edition to this is the bloom and leaves from wild purple violets. Tasty. Erich, have you ever tried young nettle tips, you pick just the tips of the young plant, better to wear gloves, then wash and boil the leaves. they are very tasty and contain quite a lot of vitamins including Iron. I’ve eaten them a number of times and have found that dandelions growing in the woods where they get some shade taste much better than those from more sunny spots. @Tactical Intelligence yes sir cant wait for this years crop too !!!!!!!!!!!!! Erich, I recently just started reading your blog and I am very impressed. Being a single mom of a 13 son, I find your info so extremely helpful but has it been your experience that people tend to call you ‘chichen little’? This has been mine. I have been told many times that I am raising my son to be an alarmist. I was raised as an ‘Army Brat’ and I could remember my dad eating things that I thought were GROSS! i was his only daughter and his opinion was that he wanted me not to rely on others especially in emergencies. This is my goal for my son. So, if you should have any further advice on how to deal with this I would greatly appreciate it. Thank you. Every Spring I collect pollen from cattails & use it as a “spice” to eggs, veggies and such. Really gives em a nice flavor. The young cattail heads really do taste nice too. I always thought of them in taste something like cross between asparagus & corn. Didn’t know about the grass.. I was under the impression we couldn’t really digest it well. (thinking of the stems and “leaves”).. but chewing to get the juice makes perfect sense. Few other greens I love to forage for because they are so tasty. Thanks for the comments Tammy. I love the pollen as well. Dandelion flowers are good too! I collect these (who does not have dandelions) & cook em up with eggs. (I like to cut the stem part off because I don’t like the bitter stuff). They make a nice addition to tea as well. Just be sure wherever you are collecting them that no chemicals are being used. Thanks for the info! Do you explain somewhere how to tell the difference between conifers since many people call all of them pine trees? Yes surely can get some great flavourings for food and I too use dandelions quite a lot – awesome flavouring! Not sure about eating sting nettles to be honest !! Only eat the small leaves as they are not as bitter. Also the flowering tops are great dipped in egg and rolled in flour and fried. When fried they taste almost like fried zuchinni. Also dry the roots and use later in tea form to detoxify the liver. Green Deane describes three ways to leach acorns. 2 Grind them into a course meal and soak several days or weeks (depending on the species) in many changes of cold water until the water runs clear. 3. Boiling (IN A VERY SPECIFIC PROCESS). He says not to bring to a boil or to place in cold water after boiling, or else the tannins will be locked in. Deane says that you should place them in already-boiling water until the water turns dark, then to place those acorns in another pot of already-boiling water, repeating the process. He also claims that boiling cooks the starch and removes the oil. home grown, although it can be done in an office as well. of the users tend to buy. dandelion salade is best in spring , when they just emerge from the earth . Yeah , its a little bitter , but you may aquire the taste for it . When they mature , you may want to cut them fine and cook like spinach mixed with some sweeter greens . And dont forget the flowers ! You can also look for varieties specially bred for eating. there is another acorn that can be eaten with out processing it it’s call a pin oak. It has a long acorn. Blech.. bitter, bitter, bitter… Cut the stems off, & you’ve got a pretty good salad going on. Throw in some early spring cattail shoots, wild onions, black walnuts, good stuff maynard! As far as earthworms go, wouldn’t you gently squeeze them from head to tail slowly to get the dirt/poop out of them first? I’d wash the mucus off them too, if I could. Might make them a little more palatable. Also, any dandelions, greens, grasses, leaves, whatever is going to be better if they are young so as to be more tender, less fibrous, and less bitter. I always was chewing on a grass seed shoot by pulling them upright out of the rest of the stem and chewing on the tender part that was enclosed. Why do you think they called the country folks “hayseeds” ? They are good tasting and juicy. Stinging nettles, if I remember right, should be picked (with gloves on) and boiled like spinach. Isn’t that right? I guess there’s still a lot of things that I need to know. I was really surprised with this post, I didn’t know almost all of these. Thank you, at least now I know more about the uses of these plants. Great piece! Grass can also be tossed into a juicer to get the nutrients out! Taste great too! Not necessarily. If you are not allergic to this plant getting stung by it will not cause you harm. The trichomes are the ‘stingers’ and its histamines that are getting put into you when you get stung. It actually helps thwart off seasonal allergies. Once dried out or boiled there are no more trichomes. Use the stems as a spagetti alternative! Regarding the acorns. Whites are best including live oaks. Put the acorns in water. The ones floating have air pockets and larvae in them. You want the ones which sink. Figure on half of those gathered. Of course, the worm is edible, too, and can provide some protein or removed for a fishing worm or to attract squirrels and wildlife to a trap. If you can crack and crush the acorns, you can put them in a cloth bag or t-shirt, then soak in a running stream for a week, but another way and conserving water, is to put in a bag and inside your toilet water basin. Every time you flush, it washes tannins away. You just need to have running water to help wash away tannins. If not, they will get bitter. The remaining dough can be eaten raw, or dried for flour. Regarding pine nuts. Put the pine cones near your fire to soften them up or loosen the nuts. Some trees like the slash pine or scrub pine have adapted to release nuts from cones after being exposed to wildfiresheat. Especially in Florida where they have adapted to fires in the dry (winter) season. I would also mention gathering duck potatoes since they are widespread in water ways. Taste like potatoes. Also named watato, and Katniss (the name of the heroine in Hunger Games… maybe because of the arrow-head shaped leaf?). Just call her “Ducky” for affection! ha ha! You want the arrowhead variety, not the one with a lance-head shaped leaf. You have to rake them out of the mud and they will float. Pulling only leaves them behind. Once again, unpolluted water is recommended. In your opinion, which acorn would you say has the most tannin in them and would require the most soaking? Over the last few years, I’ve read that the male pine cone (the above article called them ‘male pollen anthers’) are edible if boiled or baked. All the websites I’ve visited repeat the same information, but they do not provide any further explanation on the process. We are surrounded by pines. They have yet started releasing the pollen which coats everything with a nice yellowish-green powder called pollen. I curious on how the male pine cones taste when cooked. Tannic acid is pretty rough on the kidneys and liver. Where you said that White Oak acorns can be eaten without leeching–eek, yeah, a few, but if you actually have a few meals of them the tannic acid will start poisoning you! This is actually part of why squirrels bury so many more than they will eat in one year–when they find their older stashes, they’ve become less full of that tannic acid. Another thing to be aware of is the acorn weevil. If an acorn has a hole in it, it DOES have acorn weevils. If it’s still heavy, there might be useable meat inside. Otherwise the whole thing might be, basically, worm-poop. If you get into an acorn with a worm in it, there are two options; keep whatever good meat is there, or keep the meat–and the worm. “If you eat my food, I eat YOU” works very well in this case. Just dry them out and grind them; either use as a separate protein meal or mix back into the acorn flour when it’s been processed. Hope that’s useful for you–I’ve sure been having fun with acorn flour and cattails. I’m looking forward to wandering around this site some more–I like that you look at it from the position of someone with not so much money, because that’s me! You can also cook them just like mustard, turnip, kale, and collard greens. Cut bottoms off wash cut or tear them up with your hands cut an onion medium size use salt, pepper a capful of vinegar or two depending upon how much you’re making. Also add a tsp. or a tbs. of sugar to turn the bitter taste of the dandelion greens. Cook until they become tender then add onions simmer until onions are clear. If you like add other spices. I like the spice it’s nice. Also with the dandelions, they can be infused as a medicinal tincture, or balm that can help with muscle pains, bug nights et cetera. Pick the younger leaves before the plant flowers as they are less bitter. They are more bitter after the plant has flowered. Also another great plant for those in SW is Buckwheat. The most common along the coast is CA Buckwheat (Eriogonum fasciculatum) but any buckwheat will do. The flowers can be made into a tea or the dried copper colored seed heads can be used raw or added into other flours. Just pull the dry flower head off and remove any sticks. The seeds are really small but high in fiber. Hey I’m new here. I’m not positive if this is the right place to post this, but I’m wondering if anyone has tasted Athletic Greens for their green drink? I’m seeing that most either taste overpowering or cause my stomach to cramp. Put the acorns in a pail of water. The ones that float are typically ones with worms. White oaks, and live oaks have the least tannins. You can soak the acorns for a couple of weeks in a flowing stream bed, or, if you have plumbing, put them in the back of the toilet for a couple of weeks and the flushing process will help leach out the tannic acid. Otherwise, crush and boil. Cattails near heavily travelled roads and highways will have a lot of pollutants. Find them in areas more away from major roads. Grasses are flat, rushes are round, Sedges have edges! Also, don’t forget clovers but eat in smaller quantities. I learned that animals forage so we should too. It is always a good idea to nibble plants we are not used to eating on a regular basis or which we know agree with us. You can chop up the dandelion roots, roast and grind them and make a coffee out of it. Maybe you should add something to your section about cattails concerning the deadly look-alike plant (called blue-root or something). I did not read thru all the comments, so maybe someone already did. Thank you for the goiod writeup. It actually was a leisure accolunt it. The Fantastic Four « Project Rolling Freedom!